Smiling for the whole world to see. For I know Heav'nly Father loves me. We are all like stars. Blessed with the light of Christ, no one was exempt. This Christmas season, as we focus on the symbols of Christmas and what started Christmas, lets remember to share that light we were blessed with. I know that for me, I have been blessed to have my light rekindled by another's light, so I try to pay it forward and share my light with others. We were brought together for a reason. Heavenly Father knows what he's doing when he brings people into our lives, whether to help us or for us to be his hands in helping others. We are all meant to shine. This time of the year it's easy to get wrapped up in the wrapped gifts and the parties. Remembering he is the gift poses as quite a challenge at least for me. When this website was shared with me a few weeks ago it really made me reflect on how I celebrate the season. I would like to offer you the same opportunity as the season is kicking into full swing I challenge you to take a little time to visit christmas.mormon.org and watch this short video. He is the gift my soulful sisters. Let him in and allow his light to heal and lift you through this season and through this next year. Monthly challenge: share the gift and the light this season by serving others. 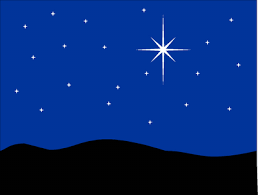 Of all the symbols of Christmas, the Star is one of my favorites. As I was contemplating the Star this week, I thought of how it did exactly what it was created to to -- IT SHINED!!! All it had to do was be itself, and it led people to Jesus Christ after His birth. We are just like this star! If we allow ourselves to be the person we were created to be and let our Soulful Brilliance shine, we too can lead others to Christ! One of my favorite Primary songs is called Every Star is different. And so is ev'ry child. And some are meek and mild. For just what he can do. Who ever can be you. That come from God above. To learn to choose the right. Will let my star shine bright"
Let your star shine bright! Help lead others to Christ by being the you you were created to be! I am really excited to share on gratitude and blessings today. It seems that when a topic comes up for discussion, it is usually one I need to work on or have recently had an experience with. Or both. As we the holidays, our hearts start turning to feelings of gratitude for our families, the Savior, our neighborhood, friends, and everything we have in this life. We reflect on the stories of our ancestors and their journey to get to a place called Zion along with the stories created with our families today. Although the conditions are a bit different, there is a common denominator and that is gratitude and counting the blessings that surround us. Now I didn’t say that gratitude and blessing pop out of the ground like daises and come sweat free. When things are going great in my life, I am so thankful for what I have been given. I have a positive attitude and all is well. This is what I would think most people would feel like too. Funny enough though, when things are rock bottom, scary, or too much to handle I start thinking in a similar way. Not necessarily right off the bat but it happens. I am thankful for the ones I have around me to support me, I am thankful for the power of prayer and priesthood blessings, the love Heavenly Father shows me, and so many other blessings that seem to rush in. I see those blessings with the highs and lows but sometimes I forget that they are present in the middle are of my life. The middle for me is a normal day of chasing two four legged fuzz balls around, postponing cleaning as much as I can and then frantically clean before Eddy gets home, running errands, making dinner, and spending time with my amazing husband when he gets home. With all the hustle and bustle, I often skip over recognizing just how many blessings I have. I get at least 2-3 miles in just walking to the door to let my indecisive dogs outside or inside, I get to make a mess of the house for no reason and blame it on “reorganizing”, and last but not least I get to stay home and take care of the house while my husband supports our outrageous vet bills and my sewing/fabric addiction. Ok on a serious note though I am very grateful for him and all that he does to support our family. There is so much that we can find in the middle days to be grateful for if we just take the time to look for them. I want to share a story with you about a man named Henry Glegg Jr. Henry Clegg Jr. was a finisher. He joined the Church with his family when the first LDS missionaries went to Preston, England. Henry had a view of his destination in his mind as he and his wife, Hannah, and their two young boys immigrated to Utah. While crossing the plains, Hannah contracted cholera and died. She was laid to rest in an unmarked grave. The company then moved on, and at six in the evening, Henry’s youngest son also died. Henry retraced his steps to Hannah’s grave, placed his young son in his wife’s arms, and reburied the two of them together. Henry then had to return to the wagon train, now five miles away. Suffering from cholera himself, Henry described his condition as being at death’s door while realizing he still had a thousand miles to walk. Amazingly he continued forward, putting one foot in front of the other. He stopped writing in his journal for several weeks after losing his dear Hannah and little son. I was struck with the words he used when he did start writing again: “Still moving.” When he finally reached the gathering place of the Saints, he began a new family. He kept the faith. He continued his story. As we approach the new topic for the month, yes I’m late on posting but I promise to do better next month, my challenge to you is to post a comment. Let us know what you think on the topic at hand. Do you have similar stories that you want to share? We need the support of each other and that means we need you too. If you need help getting into the comment section email us and we would be happy to walk you through it. Remember you are important and your thoughts. Please share. You never know who needs to hear what you have to say.